One of the most exciting parts of this rebrand is seeing the physical transformation from our “old selves” to our shiny “new selves”. Last week I talked about our online transformation on our various social media platforms. This week we had our sign on the outside of our office changed over and it is thrilling that thousands of people will see it as they drive by our office every day. 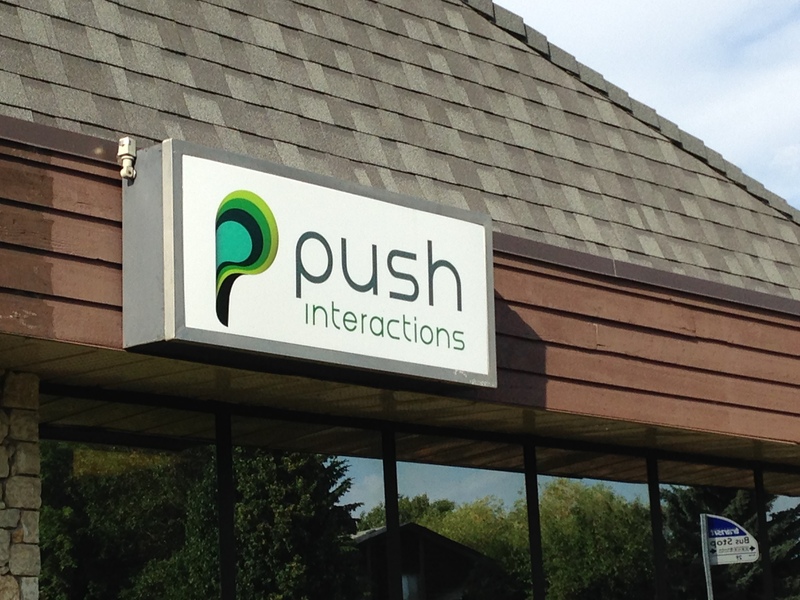 Our brand new sign on the outside of our building. Honk if you approve! 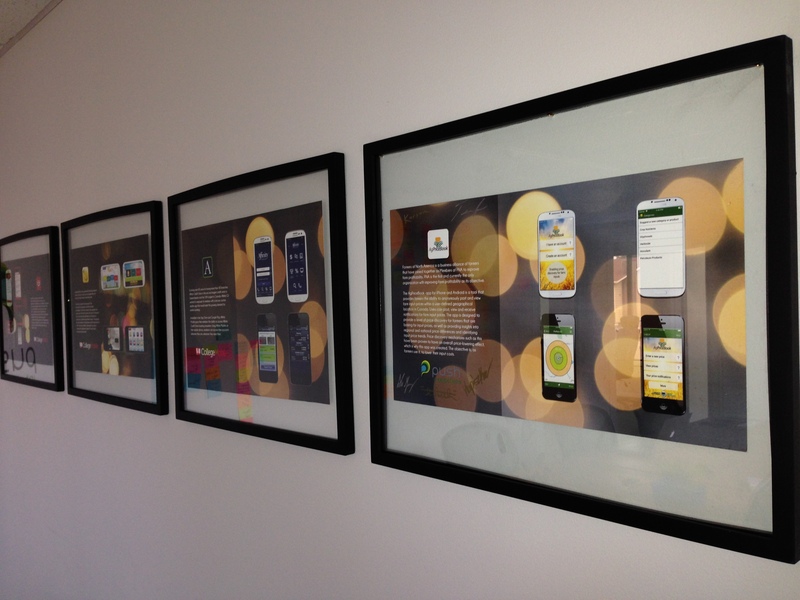 In our boardroom we have a “wall of fame” where we display apps we developed. The app on the far right is the first app we published as Push for Farmers of North America. We have greeting cards we can use for thank you’s or congratulation cards. The new business cards are still a work in progress but here you can see our first drafts of the cards. We would like to incorporate a more “mobile feel” into the cards as our last cards for CollegeMobile were shaped like little smartphones, which people seemed to really like! 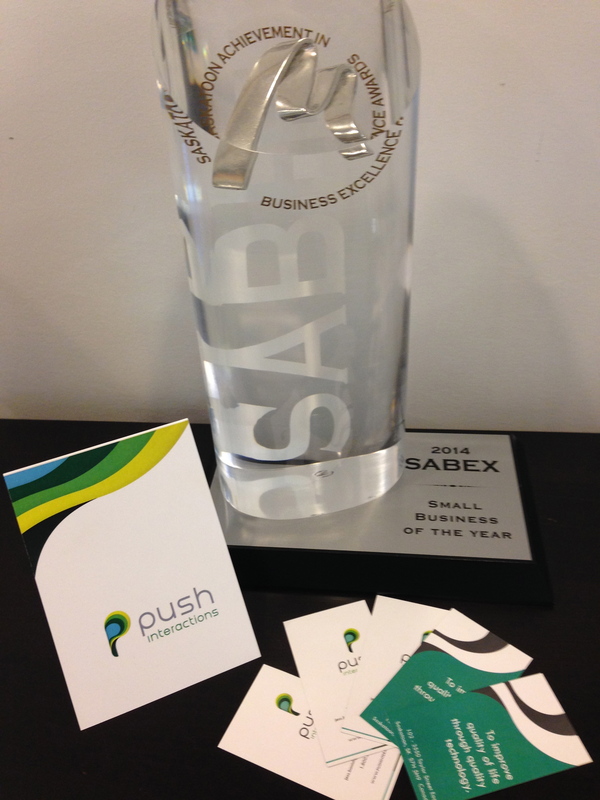 I took a picture of these beside our very first award that we won as Push Interactions, our SABEX Small Business of the Year Award. 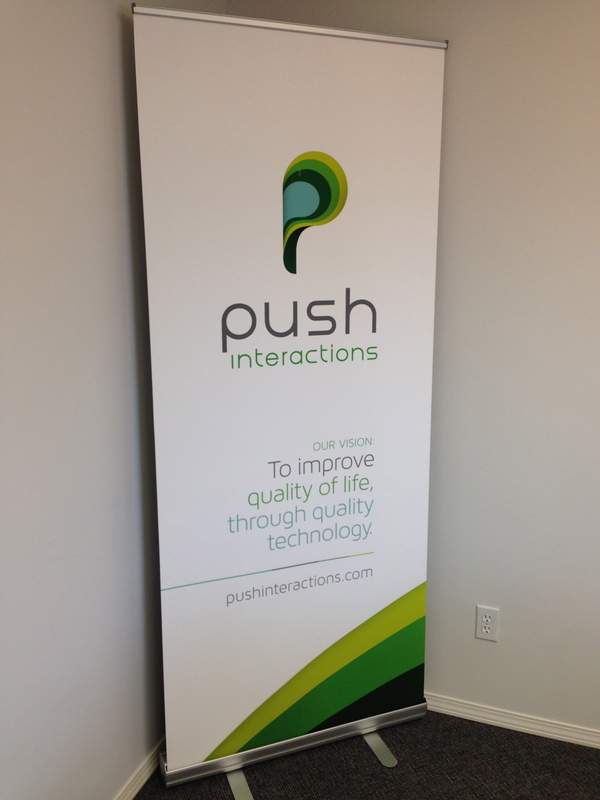 Our banner sign was one of the very first items we purchased with our new name on it! When we first brought it to the office we unveiled it to the staff and everyone clapped and cheered! This if one of my favourite pictures that was taken during our staff photo shoot (blog post about that to come soon!). 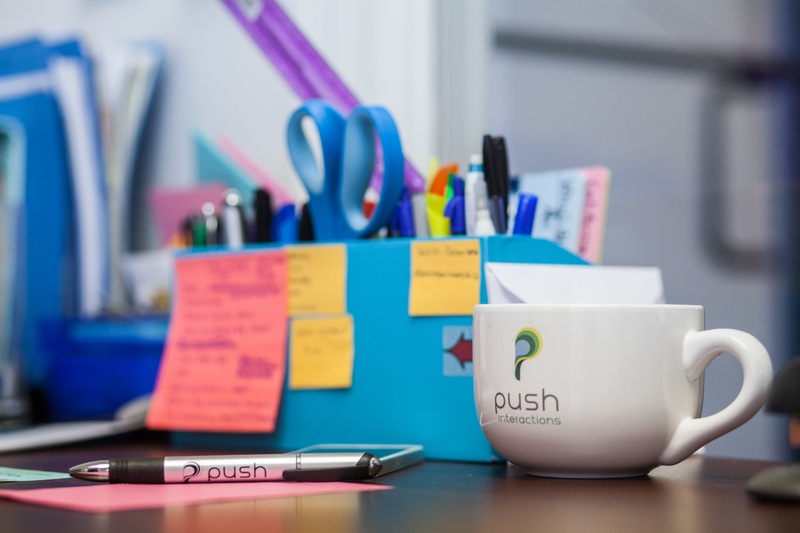 The photo has a real-life quality to it as our brand is nestled amongst the bustle of the busy working day. (If you know me at all, you know I love sticky notes!). I can’t wait to brand other cool swag to give out with our new name! As I have said in previous blog posts, we loved our CollegeMobile name and branding but it was time to move on and have a new name and image. Every time I see a new physical or digital piece come into place with our Push branding I feel proud of our company for the success we have had and also excited for the future success as Push Interactions.